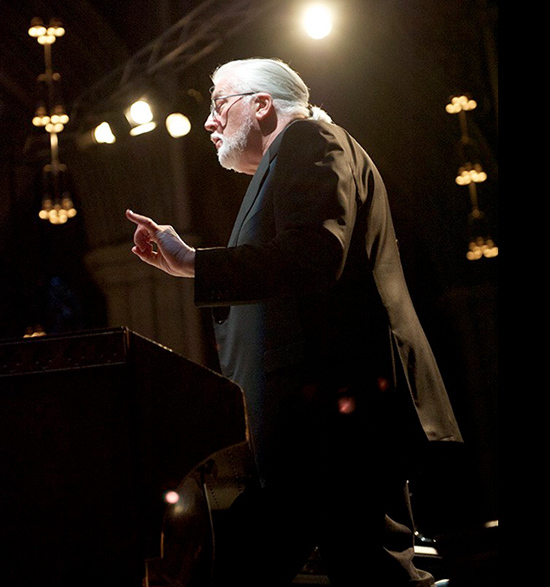 This fabulous presentation is what remembering Jon Lord should be all about. It consists of a restored film of the 2010 concert in Trondheim Cathedral in Norway, wrapped inside a detailed website full of information, photographs and recollections. So you can play the show as well as read about the whole experience online. What is more, the concert if free to view. The concert will not be new to DTB readers as we have written about it before thanks to Christer Lorichs, whose daughter was one of the vocalists (which Christer not surprisingly told me at the time one one of the highlights of his life). Christer has put the web site together with care and it’s a very subtle treatment, making great use of the images. The music consists of To Notice Such Things performed in full, with musicians hand picked for the Lord Chamber Orchestra. There is a new arrangement of The Telemann Experiment (one of the real highlights of the Beyond The Notes album), and two fascinating reworkings of Deep Purple tracks; Soldier of Fortune and Child in Time, the latter performed for the first time with a children’s choir. The evening also included some tracks from earlier albums, two from Sarabande. I said restored earlier. The original sound recording of the concert was lost, as was some of the footage, but Christer was able to use alternate source material to recreate the complete experience. So while there are times when the audio is not 100%, it is at least preserved. For many musicians, throwing up a few archive clips on YouTube is about as experimental as they get. This shows what can be done when money isn’t the driving force. My thanks to Christer for the information. Find yourself a little time to enjoy it. “Your boyfriend is one hell of a drummer!” Jon said to Nathalie after the show. “Usually I have to wave my whole arm. To him I only had to show my little finger to get a reaction”. While this is such a wonderful gift, am I the only one who has to view it thru a darkened window type effect? I assume that is so someone cannot download the show and sell it or something? The video image is ‘watermarked’ for lack of a better term. Everyone experience this or just me? Hi Scott, that should not be the case. Try another web browser, check on alternate computer, etc. Hope it works out for you.